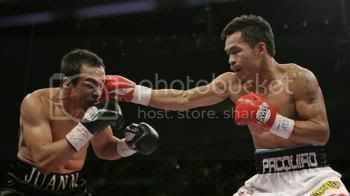 Manny Pacquiao beats Juan Manuel Marquez in the WBC Super Featherweight Title Match on Saturday, March 15, 2008. LAS VEGAS (AP) — Manny Pacquiao's rematch victory over Juan Manuel Marquez was worth every minute of the four-year wait. Pacquiao won a narrow split decision to claim Marquez's WBC 130-pound title Saturday night in a sensational fight that left two of the world's best boxers bloody and triumphant. Though Marquez landed more punches at a higher percentage, Pacquiao (46-3-2) knocked down Marquez (48-4-1) in the third round and persevered through a nasty cut. Marquez also was cut, but neither backed down from one scintillating exchange after another. Their first matchup ended in a draw in May 2004. Marquez was knocked down three times in the opening round of that acclaimed bout, but the Mexican champion improbably rallied to win most of the later rounds in a possible career-saving performance. An immediate rematch was scuttled by financial arguments, and Pacquiao went on to cement his spots atop the sport and in every Filipino's heart, while Marquez made a long climb back to a match he eagerly accepted this time. The second fight was just as tight — and every bit as exciting. Judge Duane Ford favored Pacquiao 115-112 and Jerry Roth called it 115-112 for Marquez, while Tom Miller gave a 114-113 edge to Pacquiao despite giving the last two rounds to Marquez. The Associated Press narrowly favored Marquez, 114-113, on the strength of his 12th-round performance. With outstanding action in nearly every round producing bloody injuries and heart-stopping moments, the fight showed why both boxers are at the peak of their profession. One defining moment came when Pacquiao nearly had the fight won in the third round, but Marquez kept his feet. "I thought at that point I was in control of the fight," Pacquiao said. "But when he cut my eye in the fourth round, he made it more difficult for me, and I couldn't take control of the fight. ... I wasn't sure (heading into the 12th round), but I always treat the final round as the most important. I don't take any chances." From the opening bell, the action was fast and frenetic at the Mandalay Bay Events Center. Marquez staggered Pacquiao in the second round, but Pacquiao floored Marquez in the third with a left hook. Pacquiao then wobbled Marquez again late in what's sure to be one of the year's best rounds, but couldn't finish off Marquez. "I don't like the decision," Marquez said. "I still feel I am the champion. It was a bad decision. That first knockdown, he got me cold, but then I adjusted my game plan and I thought from then on, I dictated the whole fight. ... The people are the best judge, and the people are booing him. I won." Pacquiao won a major world title in his fourth weight division, and he intends to take on a fifth when he moves up to 135 pounds for his next fight against David Diaz, the WBC lightweight champion who won on Saturday's undercard. "I don't think so," Pacquiao said of a third fight with Marquez. "This business is over." Marquez, whose brother Rafael just finished a three-fight epic with Israel Vazquez, landed 172 punches, or 34 percent of his total compared to Pacquiao's 25 percent. Pacquiao threw more jabs, and Marquez landed more power shots. Pacquiao entered the ring to thousands of cheering fans and a Filipino rapper who incited the crowd with a live performance. Marquez had a white-suited mariachi band waiting for him in the ring, and his fans drowned out the sizable Filipino contingent. After a cautious start, both fighters showed glimpses of their fearsome potential in the second round. Pacquiao won several tough exchanges, but Marquez wobbled Pacquiao with a three-punch combination in the final seconds. The third round was nonstop action, with both fighters trading quality punches before Pacquiao put Marquez on the canvas with a left hook. Marquez was leaning against the ropes by the end, but wouldn't go down. Marquez cut Pacquiao with a punch in the fourth round, but Pacquiao staggered him again in the seventh, and a collision of heads opened a nasty cut near Marquez's right eye. Marquez then split Pacquiao's right cheek early in the eighth, but Pacquiao kept charging forward to take punishment with his obscured vision. They traded quality punches until the final minute, when Marquez landed a handful of combinations to do the final damage. Both fighters' cornermen raised them in victory. "It was a close fight, but we came back at the end," said Pacquiao's trainer, Freddie Roach. "It could have gone either way, in my mind. Manny followed him around the ring too much. He didn't cut off the ring like he should have. Marquez may have had a lot to do with that as well. Manny was more disciplined in training than he was in the fight tonight." Marquez could have had this fight shortly after their first bout across the Las Vegas Strip at the MGM Grand Garden, but his management complained about the financial terms. Marquez ended up fighting for $30,000 in Indonesia, where he lost his WBA title to Chris John two years ago, but Marquez claimed the WBC title last year by beating Barrera.